While dining in Montreal is a great way to sample the culture of this Canadian city any time of year, springtime in the city brings with it rooftop patio and terrace season for local restaurants and bars. 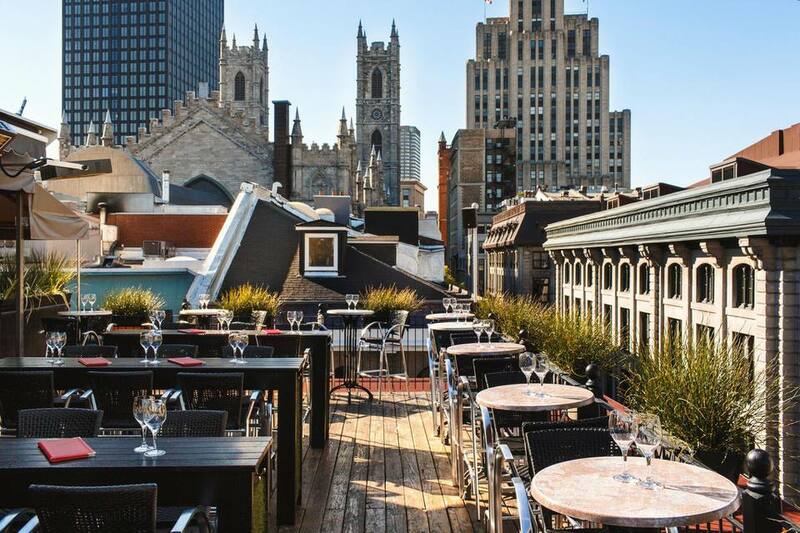 Known as terrasses by the locals, these rooftop spots are available April through October each year, during the warm seasons in Montreal and eastern Canada. From posh spots to watering holes, casual pubs to date-worthy restaurants, there are plenty of chances to enjoy a rooftop terrace or outdoor patio. As a quick note to smokers, if you're caught smoking or even vaping on Montreal's commercial patios as of May 27, 2016, you risk having to pay a hefty fine. Be courteous and keep your distance from dining areas and doorways when smoking in public in this health-conscious city. Located in the heart of Old Montreal near Jacques Cartier Square, Jardin Nelson offers a solid bistro fare and a fantastic brunch menu in one of two floral-lined courtyards. Live jazz bands play throughout the spring and summer, and Jardin Nelson's terrasse is open rain or shine. Crowds at this restaurant range from casual to posh and include both tourists and locals that enjoy European bistro cuisines like crêpes and danishes. Jardin Nelson is only open during the warmer seasons, and typically opens mid-April and closes mid-October since there are outdoor heat lamps and parasols. You'd never guess by the front door and scuzzy side street that one of Montreal's loveliest courtyards is hidden away inside Pub Saint-Élisabeth in downtown Montreal. Featuring a terrace with trees sprouting through the outdoor tiles and a moderately-sized space surrounded by four 45-meter (148 feet) tall walls covered in ivy. Conveniently located just a few blocks east of Place des Festivals, Montreal's summer festival epicenter, Saint-Élisabeth features standard fast foods like pizza and poutine along with the Ste. Élisabeth house beer. The Six Resto Lounge atop downtown Montreal's Hyatt Regency hotel opens its rooftop and garden terrace in the spring and summer each year. However, few people, including locals, even know it exists, making a visit to this hidden treasure a truly enjoyable experience, even in the heart of Montreal's busy summer tourist season. Offering views of Place des Arts and the city's outdoor festival hub below along with tapas, a bistro, and full bar of specialty cocktails, Six Resto Lounge is a great place to catch a summer sunset right on Jeanne-Mance and Ste. Catherine. In French, a brasserie is an informal restaurant that offers a laid-back atmosphere, some local brews and some simple yet traditional French food options. In Montreal, there's no better place to experience a classic French-style brasserie than at Brasserie T, the brainchild of one of the country's top chefs, André Sterling. Also located on the corner of Ste. Catherine and Jeane Mance (like Six Resto) and featuring an outdoor terrasse, Brasserie T offers nearby access to and great views of some of the city's biggest summer festivals. Rooftop patio aficionados with cash to burn and a craving for killer cocktails will love the terrasse at Pandore. Located on the top floor of the 222 Building in downtown Montreal, this restaurant doubles as a nightclub called Pandore Rooftop at Night. Featuring a 100-person-capacity roof deck with great views of Quartier des spectacles and downtown, you can share some tapas or grab a cocktail before you dance the night away to some of the biggest nightlife staples in the international circuit. Originally opened in 1976, Café Santropol features one of the most beautiful garden courtyards in the city. Serving sandwiches, teas, coffees, light snacks, and ample vegan and vegetarian options, this café has become a popular spot for locals in the Plateau and Mile-End neighborhoods year-round. The best time to visit and enjoy the space is after 2 p.m. weekdays and between 9 and 11:30 a.m. and 3 to 4 p.m. on weekends. Located in the heart of the Montreal Gay Village, Le Saloon has been in operation since 1992, serving an LGBTQ-friendly crowd traditional bistro fare like soups, salad, sandwiches and quiche. Le Saloon's drink menu is pretty extensive, but their sangria pitchers and 5 to 7 drink and food specials are a local favorite. You can dine indoors, at the bar, or on a sidewalk terrace on the corner of Rue Panet and Ste. Catherine East. After spending the day wandering around the Montreal Botanical Garden grounds, you can head to the on-site restaurant of the same name, grab a snack at the Resto-Vélo, or bring a picnic to designated areas at the Frédéric Back Tree Pavilion. Offering live music and 5 to 7 specials nightly from 4 to 8 p.m. every Thursday through Saturday mid-June through Labour Day, the Botanical Garden is a great place to enjoy the spring weather and nature in Montreal. Hôtel Nelligan's rooftop terrace restaurant, Terrasse Nelligan offers a stunning view of Old Montreal, notably the ​Notre-Dame Basilica. You can enjoy summery dishes and seasonal cocktails while sitting eye-level with the top of the Basilica or turn around and look out over the St. Lawrence River port. Featuring tapas of contemporary French and fusion cuisine as well as a whole menu of specialty cocktails, Terrasse Nelligan is only open from June through October. Originally constructed in the late 19th century by the president of one of Montreal's biggest banks at the time, Le Saint-Sulpice Terrasses is a Montreal historical landmark featuring multilevel patios, courtyards with fountains, and a small pub and nightclub called Bar Saint Sulpice. Popular with the University of Quebec at Montreal (UQAM) students, the terraces are as big as the four-floor bar, making it a convenient meetup spot for large groups. In the Old Port of Montreal, on a docked ferryboat originally named the Arthur Cardin, Bota Bota is a floating spa, garden, and terrasse located right on the water of the St. Lawrence River. Montreal's only boat spa doesn't have a problem with folks dropping by for a drink and a bite without booking any spa services but there's a chance you might get turned away if you only want to drink and eat since spa patrons get priority access to the terrace. On weekends, the boat fills up fairly consistently with folks booking the water circuit or a massage. The menu for the restaurant and bar features French fusion bistro fare including vegetarian and vegan options. Featuring a Tuscan-style terrace on the streets of the Museum Quarter, this classic Italian eatery is a hidden gem nestled behind a grey stone-fronted office building on Sherbrooke Street West. With close proximity to the Montreal Museum of Fine Arts and many of the city's best museum attractions, Il Cortile is a great place for a romantic meal in the alleyway courtyard. Although New City Gas is located 15 minutes from the nearest metro station in the gentrifying industrial Griffintown neighborhood, this popular club features an outdoor courtyard terrace on Thursdays and some of the biggest names in EDM on the weekends. Featuring spring and summer 5 to 7 p.m. drink and pop-up kitchen specials like tacos and ceviche, this club, bar, and nightlife destination is not only a great place for a weekend rager but also an after-work drink. Although the downtown public square Place Emilie-Gamelin had difficulties with public intoxication and drug use, homelessness, and unwanted altercations in the past, the city of Montreal began a revitalization project in 2015 that cleaned up a lot of the problems. Now, Place Emilie-Gamelin offers free events, concerts, and activities during the summer as well as a new outdoor terrace with a food and drink kiosk. These days, you can grab al fresco lunches and after-work drinks at Jardins Emilie-Gamelin from May to September. New facilities at the park include repurposed shipping containers, a stage, urban agriculture, and a local produce market at the end of the summer. The park is located on the corner of Ste. Catherine and Berri in downtown Montreal. Marché Jean-Talon is North America's largest market, featuring everything from coffee and butter croissants to grilled merguez, sweet crêpes, and fried calamari as well as plenty of terrace space to enjoy a meal or snack. Even the pickiest eater will find something at Marché Jean-Talon, which is located in the Little Italy neighborhood of the city on the corner of Henri-Julien and Jean-Talon. Located inside the Ritz-Carlton in downtown Montreal on the corner of Drummond and Sherbrooke West, the Maison Boulud offers a fabulous Jazz brunch experience, holiday specials, and a full menu of specialty cocktails. The restaurant's garden features a duck pond, waterfall, and zen landscaping in an elegant upscale setting, perfect for a romantic meal or even an important client dinner. The menu at Maison Boulud is prepared by Executive Chef Riccardo Bertolino and features truly unique dishes that combine traditional French flavors with Mediterranean spices and New York City and Montreal flair. A charming pub one block southeast of Parc La Fontaine, Grenade proposes killer cocktails at affordable prices. Located at the edge of the Gay Village and the Plateau neighborhoods, Grenade has a backyard patio and some of the most creative drinks in the city. You can try the Bloody Kimchi made with vodka, saké, rice vinegar, soy sauce, clamato juice, and sriracha or the Lucky Sangria, an unexpected combo of peach vodka, saké, white cranberry juice, ginger beer, and fruits. There's also an Asian fusion snack bar menu filled with steamed buns, dumplings, and other savory gems to fuel you up before you head out for a night of dancing. Les Enfants Terribles sits atop Place Ville-Marie and offers a skyscraper 360-view of Montreal from the downtown area. Located alongside the Montreal Observatory au Sommet Place Ville Marie, the views at this restaurant and bar are unmatched anywhere else in the city—but the prices can be quite high as well. The dinner menu features seasonal market-fresh items including braised lamb shank, shepherd's pie, chicken pot pie, homemade black pudding, fish and chips, pasta, soups and salads, and oysters. Meanwhile, the cocktail menu changes with the weather as well, featuring such creations as the Nevsky, a drink with White Keys vodka, Contratto Aperitif, Vermouth Bianco, and grapefruit zest and the Sante-Marie, a Sante-Marie rum, Rouge Gorge vermouth, Angostura, and orange zest cocktail. Terrasses Bonsecours is an open-air restaurant right on the St. Lawrence waterfront in the Old Port of Montreal. Featuring New Canadian menu dinner options, a full list of seasonal cocktails, a dance club, and a rooftop patio, this hipster restaurant is a great place to catch the sunset while grabbing a bit to eat or drink after work. Bistro is the name of the outdoor restaurant, which features a tapas menu of BBQ and fusion cuisine while the aptly named Nightclub hosts some of the best promoters and DJs of Montreal starting at 10 p.m. Wednesdays to Sundays year-round.